The Institute is running an Integrated School to impart primary level education to the children with mild to moderate locomotor disability. 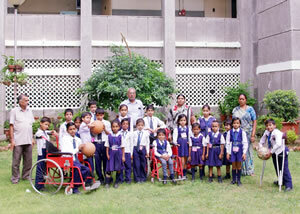 The children with disabilities are studying together with their non-disabled counterparts in this school. The school is recognised by the Education Department of Municipal Corporation of Delhi. As on 31.03.2010 the school had strength of 52 children including 37 boys and 15 girls out of whom 48 were children with disabilities. 15 Students passed class Vth this year. They all got admission in the mainstream schools. During the year 2009-10 the result of integrated school was 96%. Mid Day Meal: The children of Integrated School get free mid day meals through out the year. It is being provided by the Iskon Food Relief Foundation (IFRF) on request of the Institute on nominal charges. The Institute is providing transport facilities to the children from home to school at nominal charges. Uniforms and text books are provided free of cost to these children. The children are provided with required aids and appliances and those who need surgical intervention for correction of deformity are referred to different hospitals and are also provided with other assistance that they may need. The children with disabilities are integrated with their normal peers in the school and are given opportunity to interact with children from other schools through participation in quiz programs, debates, painting competitions, sports meets, co-curricular activities like clay modeling, dance and music. Craft activities and training in physical exercises are integral to the activities of the schools. The school also has one separate library and a small laboratory. National Bal Bhavan organized a programme ‘EDUCATION FOR ALL’ from 23rd April 2009 to 25th April 2009 at Kotla Road, New Delhi-2. Nine children of Integrated School participated in that programme. They got school bags, T-Shirts & Prizes. Pt. DUIPH organized a Drawing Competition in the Integrated School on 14, November 2009 and distributed prizes to the children. A Drawing Competition was organized by Human Rights Organization in Bal Bhavan on dated 5th Dec. 2009. 15 children of the Integrated School participated in the above programme & on prizes. The National Museum of Natural History (NMNH), a subordinate organization of the Union Ministry of Environment & Forests organized Education Programme from 8th Dec. 2009 to 10th Dec. 2009. Fifteen students of 5th class participated in that programme & won prizes. 38th National Sports Meet for the Disabled on 26th & 27th December 2009 was organized by Handicapped Welfare Federation at Dayal Singh College, New Delhi. 20 Children of the Integrated School took part in the above programme & won prizes. students of Integrated School took part Scholarship Examination in the Session of 2009-10, conducted by Education Department of M.C.D., Delhi.